Do your conference programs include pre-scheduled sessions you belatedly discover were of little interest or value to most attendees? If so, you’re wasting significant stakeholder and attendee time and money — your conference is simply not as good as it could be. Now imagine you could learn how to routinely create conference programs that reliably include the sessions attendees actually want and need? If you could create amazing conference programs that don’t waste attendee time? How much value would that add to your event; for your attendees, your sponsors, and your bottom line? If you’re serving up a program that’s 100% pre-determined, if you’re not crowdsourcing part or all of your conference program at the meeting, I guarantee you are not creating the best possible conference program. In fact, my research has shown that at least 50% of the sessions you’re offering are not what attendees actually want. It doesn’t have to be this way! I’ve put everything I’ve learned from 27 years of participant-driven conference program design experience into my new book The Little Book of Event Crowdsourcing Secrets which covers all you need to know and do to successfully integrate effective real-time program crowdsourcing into your events and sessions. The Little Book will teach you how to create conference programs that are what your attendees actually want and need. Discovering in real-time attendee needs, wants, and resources. — efficiently obtaining suggestions and offers. — cleaning up potential topics. — selecting the most highly rated topics. Determining the right sessions to hold. Scheduling sessions to create an optimum conference program. Designing sessions that meet attendees needs and wants. You’ll learn how to select the best techniques to crowdsource all or part of any event — whether it’s a one-day meeting with thirty participants or a four-day conference with thousands. And you’ll learn, detailed step by step, how to apply these techniques to successfully crowdsource your event. 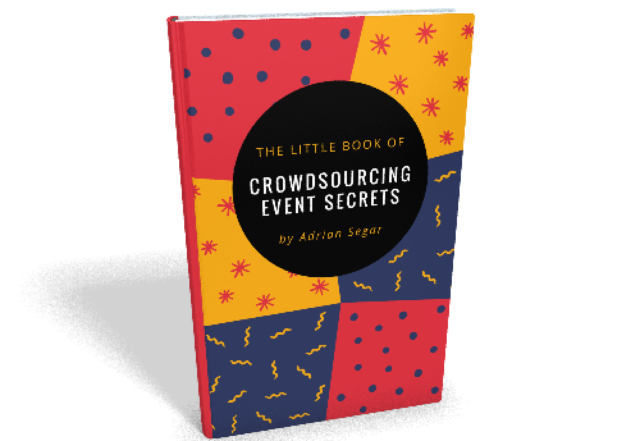 The Little Book of Event Crowdsourcing Secrets will publish in 2019. Preorder today at the guaranteed lowest possible price. There’s no charge until your order ships. Or, to learn about publication of this important new book, complete the short form below. Your information will not be used for any other purpose. This entry was posted on Monday, March 19th, 2018 at 6:08 am	and is filed under Event design, Promo. You can follow any responses to this entry through the RSS 2.0 feed.You can leave a response, or trackback from your own site. If you’re a meeting planner or an event organizer, try a Personal Introspective at the end of your event—it is just phenomenal!